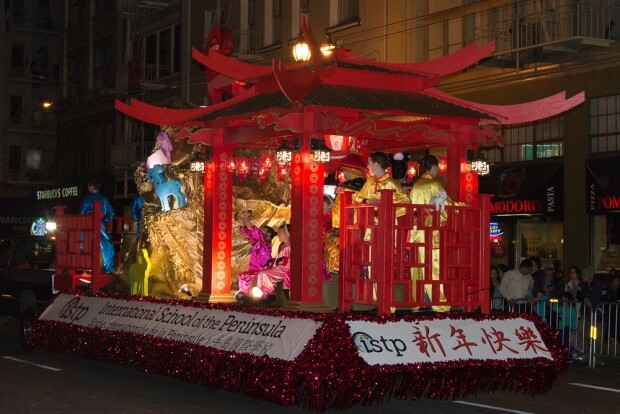 Guest Blogger Gary Meeker: ISTP Makes an Impressive Showing at SF CNY Parade! In this Guest Blog, ISTP parent Gary Meeker details the labor of love that went into making this year’s SF CNY Parade float a huge success! For the past several years, Gary has headed ISTP’s float build, and the ISTP community is immensely grateful for his enormous contribution. Fellow ISTP parent Andy Farlie says, “Each year there is a staggering amount of planning and scheduling that falls on Gary. He is pretty much first in and last out on the float project. Through all the ups and downs inherent in the float build I do not think I have ever seen anything but a wide grin on Gary's face. With that encouragement there is pretty much nothing that cannot be accomplished.” Thank you Gary! 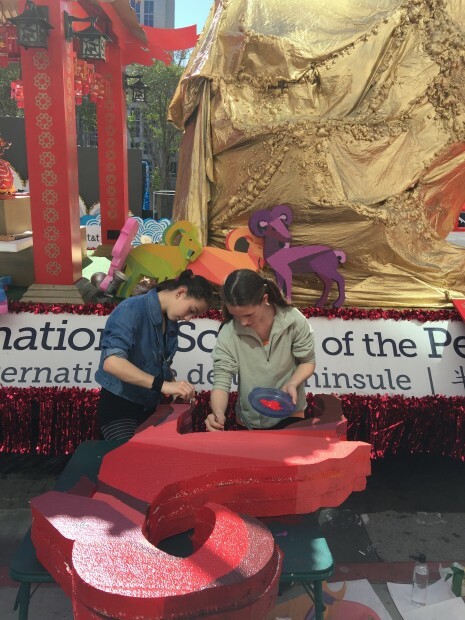 A heartfelt thanks to ISTP’s parent-volunteer float team! 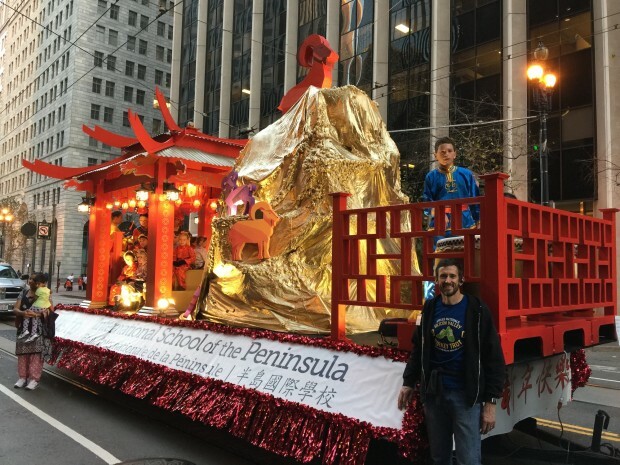 In spite of a somewhat compressed schedule and investment of a considerable amount of time to freshen and restore our float bed, we got it done and put on an impressive showing in this year's Chinese New Year Parade! I've heard nothing but positive comments from the ISTP community and those families who were lucky enough to participate in the parade this year. The weather in San Francisco was perhaps the best we've ever had for the parade. Everyone was in good spirits, in spite of the long wait due to our position near the end of the parade. However, because of that position toward the end, we were fortunate enough to be on the TV broadcast this year! Not only were we seen by more than a million people on the streets of San Francisco, but by millions more watching TV at home! 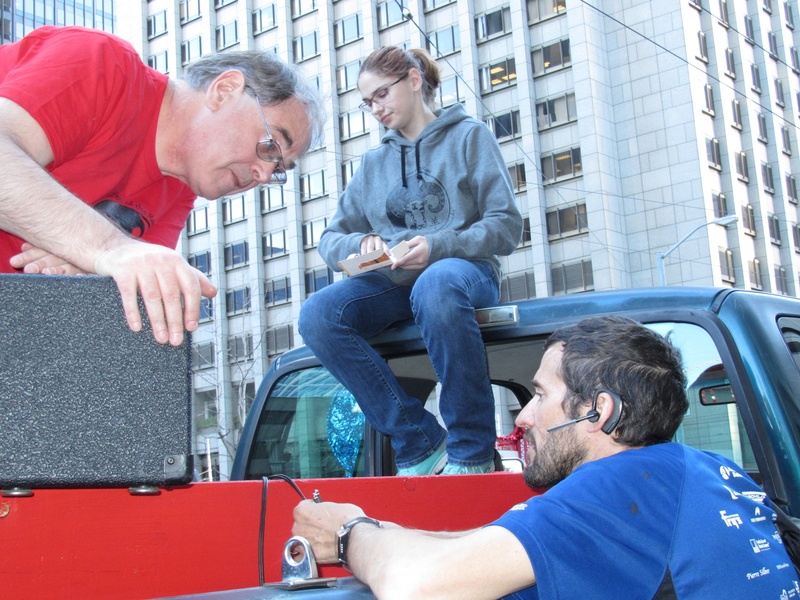 In the 2 months spent our team began preparing our float entry for the parade, we accomplished quite a lot. We began with a long-overdue refresh of the float elements that we reuse every year, including replacing all of the side panels. We refinished and repainted the pagoda parts, from top to bottom, replacing a few broken lamps in the process. We also made significant additions to the float bed, starting with a drum platform surrounded by a distinctive railing, designed to complement the pagoda. To balance this out, we added a matching railing to the rear of the float. 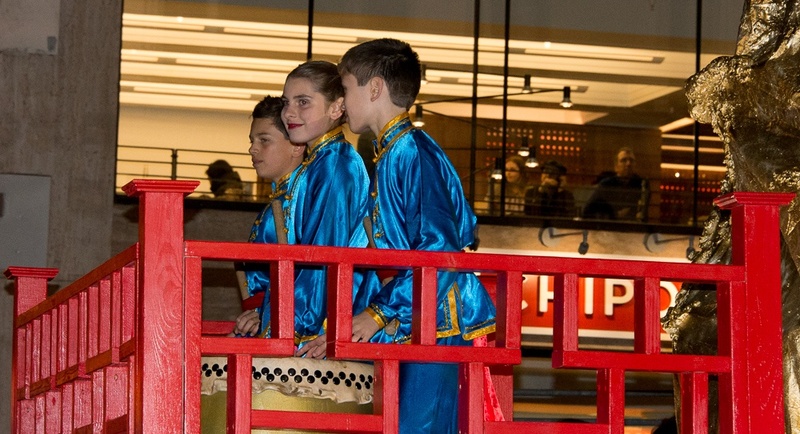 With these additions, we were able to provide the opportunity for three 6th-graders to drum during the parade, as well as a place for two 7th-graders to wave from the back. This is the first time since I have been involved with the float that we have had middle school riders, and this is a new tradition we hope to continue! The centerpiece of the float was the Ram-covered mountain, by far the largest themed element we've ever placed on the float. With the Ram on top, it towered over 14 feet from the ground, all in gleaming gold. No one could miss our float! We even refined the process of getting float riders back to the meeting point in San Francisco, which with help from middle school students, happened without any drama. The most important part of the parade effort is the incredible team of people involved, and I'd like to thank those who made it all possible. Each person brought something unique to the team, and I am grateful to have such a talented and motivated group who return year after year! Dave Del Grande returned this year as the mastermind behind the float design and single-handedly designed and built the new railings! Dave came up with the concept and plan for the mountain and frequently reminded us that it had to be big! Dave invested countless hours this year in the float build, and was the one who made sure that things looked just right, down to the paint color and details. Float design was again a family effort for the Del Grande/Svikel family with Lori Svikel creating the original design sketches and the color scheme for the many Rams surrounding the mountain. Dave brought his cousin along to help with the float setup day and Dave's mom even came to the pier for float teardown. I have no doubt that the moral support she provided by being there got things done faster! Without Dave and Lori, the float would not have been as stunning as it was. Todd Carper again allowed the float build to take over his shop for several months. With a giant trailer parked outside and bins full of supplies inside, his workplace was overrun, for the third year in a row. Todd offered his endless assortment of tools to help get the job done. This year, with the summer-like weather, he hosted a couple of great BBQs, turning float build into a big outdoor party! Andy Farlie and family were again heavily involved in the float effort. Andy was required to do less than usual this year, but usual for Andy is the work of three men! He brought his ISTP alum daughter most days to help out as well. Andy's indispensable role was pulling the float bed with his truck. No one can maneuver a trailer better than Andy and he proved it again this year, threading the float between the huge AT&T float and a parked van with less than an inch to spare on each side. This also happened to be in the dark, at the end of a very long day. The Farlie family also watches over the float bed in the off season. Gary Holmes returned this year, bringing his kids to help with the painting and focusing his work on the building of the mountain structure. Gary not only built much of the PVC structure, but also figured out the plan for covering the mountain. He also carefully cut out a template to recreate the gold decorations on the pagoda poles after the repaint, and took another crack at onboard video. 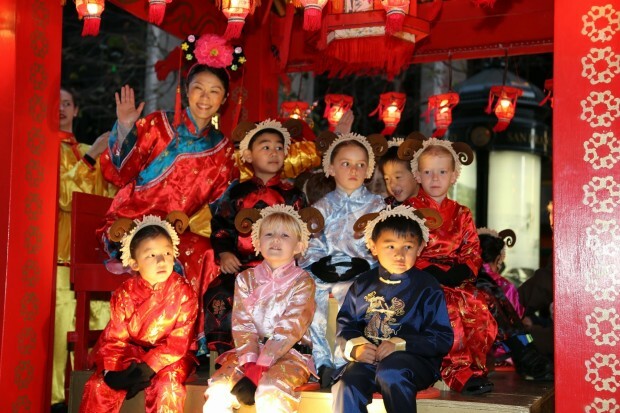 Gladys Lim was again in charge of the float rider coordination and costumes, and selected the songs for our soundtrack. It was a challenge to find sheep or mountain themed songs, but the result had the crowds hopping! She was responsible for getting all of the riders safely back to the hotel after the parade, and set up a buddy system with the middle school riders and kindergartners that worked great! Rowena Chiu handled the CNY gear orders and also coordinated the bleacher seating and ticket distribution for the parade. She did most of the work with a baby riding along in a harness! Laura Langone jumped at the opportunity to create a drum routine for the parade, taking over her son's drum lesson for 2 weeks to both develop and rehearse a great drum performance. It is hard to believe that the polished performance of our drummers came together in just a couple of weeks! David Dodson not only helped with the float work, but took on the challenge of arranging a post-parade dinner for some of the float rider families under the most challenging conditions, with guests arriving over the span of an hour and a very late start time. In spite of the challenge, he made an amazing meal at MyChina possible! Beyond those with major roles in the parade effort, we had many people come out to help with the build. Anatoly Varfolomeev helped with the pagoda refinishing and drew a freehand reproduction of the pattern on the pagoda poles that we used to create a template. 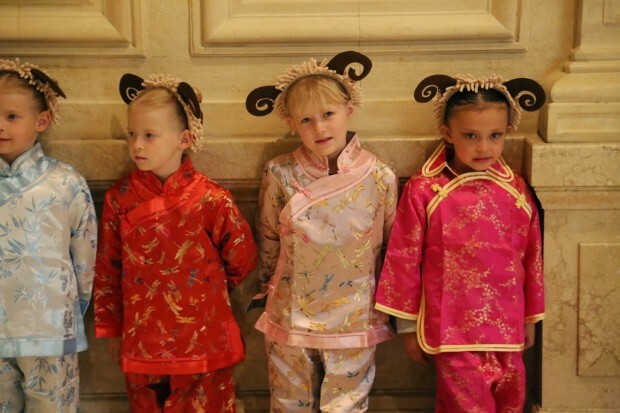 Eileen Horng and Lisa Miles brought many kids for a repainting session. Karl Kneip and his son helped with the PVC structure of the mountain. 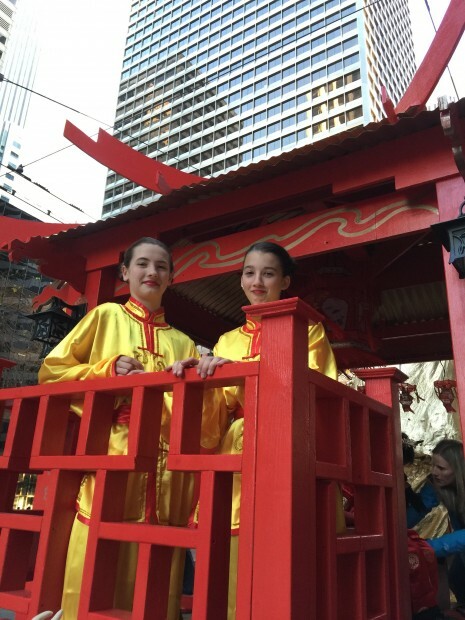 Titus Lai and Jenn Hom helped out a couple of weekends on the float bed and refinishing of the pagoda. Stephane and Tania Hauradou helped with the painting of the red railings. It is likely that I missed a few others who helped on days I was not there, but thanks go out to all! Also notable this year is that we had nearly all of the float rider families participating in the effort. Carolyn Lott repainted the gold dragons on the pagoda crossbars and did other finishing work on the rams and float bed. 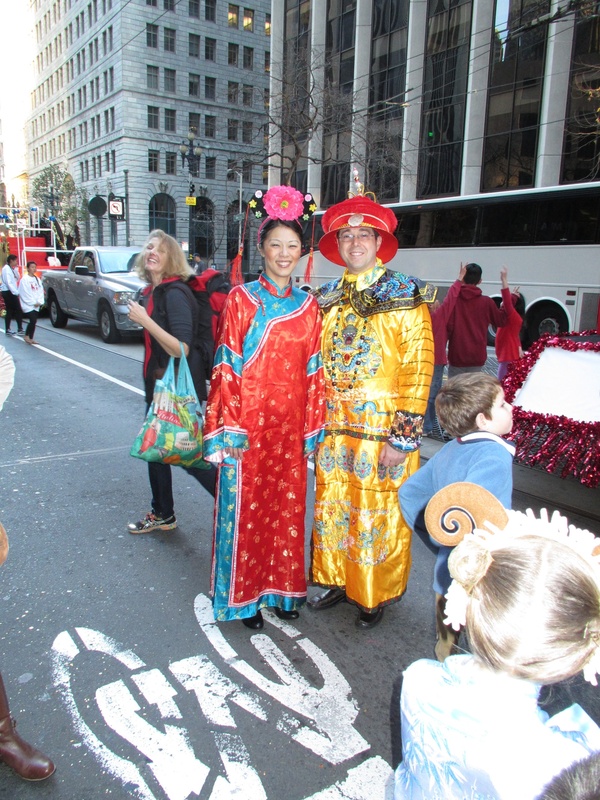 Deanna Wong helped coordinate all of the float riders on parade day. Nigel Choi, himself a veteran of the float build, came out for both the setup and teardown sessions in SF, taking the lead on the pagoda setup and disassembly. Lawrence Chang helped with both build and teardown, bringing with him just the right set of tools to get the job done. John Grantz, Mike Uohara, and Dan Campbell all joined us for teardown, getting cleanup done at record speed! Special thanks go to our fearless chaperones, Cindy Chiang, and Chris Livaccari! With our position toward the end of the parade, they had their hands full in keeping 12 kindergartners calm and happy for over 2.5 hours! Thanks again to all who invested their time and energy into this year's parade! As you can see from the long list above, this can only happen by a true community effort, and now that I've caught up on sleep, I can look forward to the next one!